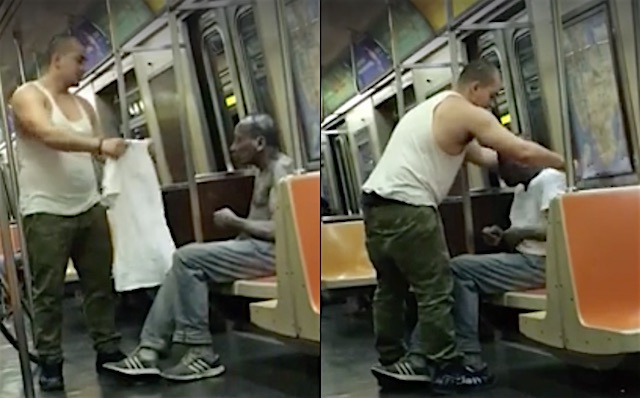 A commuter on a New York City subway literally gave a homeless man the shirt off his back. The good Samaritan, known only as “Jay,” saw the shirtless man on a subway car shivering from the cold when the temperatures were below freezing outside. Jay took off his own t-shirt and dressed the man, then returned with a knit cap, before asking him if he needed to go to the hospital. “Beautiful moment in the NYC subway,” Läzaro El Feo wrote on his Facebook page after posting a video that he recorded of the kind gesture.